When McFadden's at Citizens Bank Park closed last year, there was speculation as to what would replace it. Tuesday morning, the Phillies and Aramark, the ballpark's exclusive food and beverage provider, announced the space next to the the Third Base Plaza would be transformed into a new food venue called Pass and Stow, with a Shake Shack adjacent to it. It's expected to be ready for the Phillies' home opener against the Atlanta Braves on March 28. Pass and Stow will include an outdoor beer garden and bar with local and craft beers, Foundry Pizza serving brick-oven pies, a family-friendly sports bar and a total of 44 TVs. The outdoor space will span 11,500 square feet and seat 250 fans. The indoor portion will be 7,000 square feet and have seating for 150. Garage doors that open will connect the spaces, and there will be a split-flap board similar to the one at 30th Street Station that will show game updates. The name is a nod to the Liberty Bell. John Pass and John Stow recast the original bell in 1753. 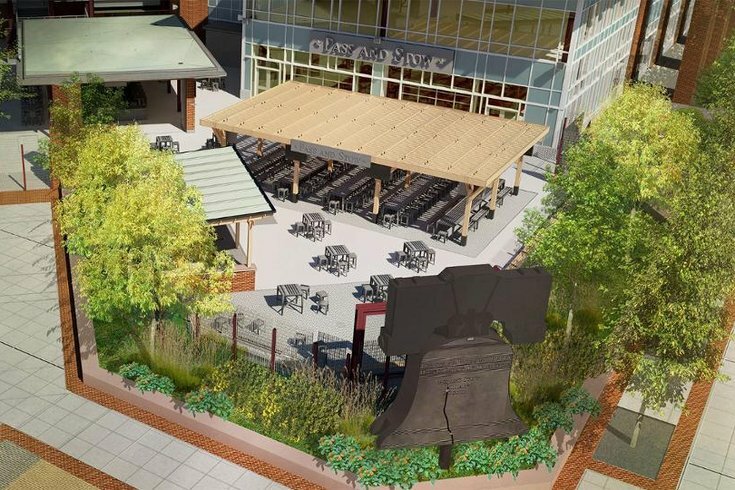 Keeping with this theme, there will be a 19-foot Liberty Bell replica from Veterans Stadium outside the new area. Pass and Stow will be open two hours before the start of each home game, and will remain open until post-game. Unlike McFadden's, fans won't be able to enter without a game ticket, according to an interview with David Buck, Phillies Executive Vice President, by Philly.com. The adjacent Shake Shack will be a full sit-down restaurant, the chain's first at a sports venue.